Have an hour to spare? Uncover the beauty of the majestic St Paul’s Cathedral – here’s what you shouldn’t miss out on. You can’t miss this beauty if you’re driving towards Queen’s Way, it falls on the left just after the MP Birla Planetarium. Dusk would be an ideal time to visit (a thorough tour of the premises will take a little over an hour!) – just enough light for pictures while you will skip getting the tan from the sun. Bonus: entrance is absolutely free! 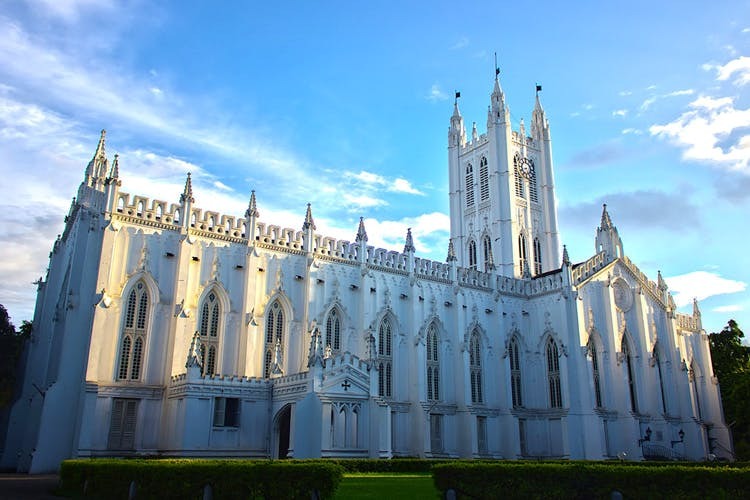 Believed to be Kolkata’s largest cathedral, this beauty took around 10 years and under 5 lakhs to build. More than for religious sentiment, thousands of tourists flock to marvel at the architectural beauty – it’s noted for its Gothic architecture. A little known fact is after suffering damage in the earthquake of 1934, it was redesigned in an Indo-Gothic fashion. Photography is not encouraged as it is a place of worship but you can go trigger happy from the outside. The regal white building with sky-high towers stands tall surrounded a green patch in the front. Apart from the standard picture you would get from the entrance, another great spot for photography is the porch which overlooks the bright green garden and serves as the entrance to the front on the main chapel. As soon as you enter, on the left you’ll find a box where you can drop your prayer petitions and another where you can send donations. A little-known smaller chapel is on the inside on the right. If you want to sit for a few minutes without the usual hustle of the tourists, here is where you can go. The main cathedral is a spectacular – the stained-glass windows, insanely high ceiling, majestic artistically carved pews and chairs, walls decked in intricate priceless mural paintings, placards dating back to pre-Independence denoting the various cities. If you take a look at some of the tiles on the floor, etched in are recognition of those who have made donations to the cathedral. The best time to visit is actually during the time leading up to ‘bodo deen’: the road outside is lit up with Christmas lighting (similar to the ones on Park Street) and a nativity scene is displayed on the premises. The Christmas Eve midnight mass itself, although spectacular, is very crowded and full of press so you might not get the serenity the Cathedral usually exudes. Fairly recent, the cathedral has also set up a Friendship Centre. Not a professional cell for counselling, but if you ever need someone to talk you can head here.